Do you use content syndication to fuel your content distribution? Because it allows you to tap into the power of other people’s audiences! Reach new audiences using your existing content with little or no additional work. Get low cost content distribution to reach new audiences. Supply quality content for your owned platforms at little or no cost. 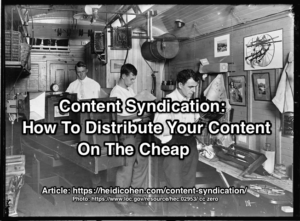 Beyond explaining syndication for content marketing, this article will show you how to add it to your distribution plans with little or no cost. You republish existing digital content on third party or social media platforms. Syndication costs are low since there’s no content creation. Costs include resources to arrange opportunities, upload your content to the platform, and paid placements. 10% of your content should be syndicated according to Curata research. Add syndication to your content marketing plan to expand your content distribution cost effectively while keeping existing content visible. Include the full article or only part of it. Consist of a variety of content formats such as articles, while papers, video, infographics and webinars. Be free or require a fee for media placement. Since you use the content as is, syndication doesn’t involve repurposing where you change the content’s format or presentation. Further, don’t confuse content syndication with content curation. Content syndication focuses on republishing your best existing content on other platforms. By contrast, content curation depends on editorial selection to pick the best information and to add related commentary. As part of your content marketing distribution, follow these marketing steps. To reach similar audiences, use your marketing persona and other audience information to guide your choice. This is particularly true for paid placement targeting. Enhance your content, brand and thought leadership by appearing on higher authority (aka: PageRank) sites. Also assess the size of the platform’s audience since you want to expand your reach. Ideally wait until the original content is crawled by search engines. At a minimum, allow 2 weeks. According to Google, creating duplicate content with syndication doesn’t necessarily hurt your search rankings. Include “Rel=canonical” in the head of an HTML document to state the preferred URL of that page’s content. Add “nofollow” to links in your syndicated content. This means that search engines will not associate the linked-to pages with the syndication website. Include a statement such as “This content was originally published on DATE in PUBLICATION (with a link to the original).” Here are 2 different examples, one from Ryan Holiday and one from Larry Kim. Include at least one relevant link to your website or blog even if the syndication site adds “nofollow” to your links. Because these links guide readers to your site where they hopefully take additional desired actions. Additionally, these inbound links are searchable allowing you to discover where your content is appearing. In addition to reducing content creation effort and cost, you can attract influencers who may not have the time to create content for you. Also, they’re likely to help promote and distribute the syndicated content you publish. 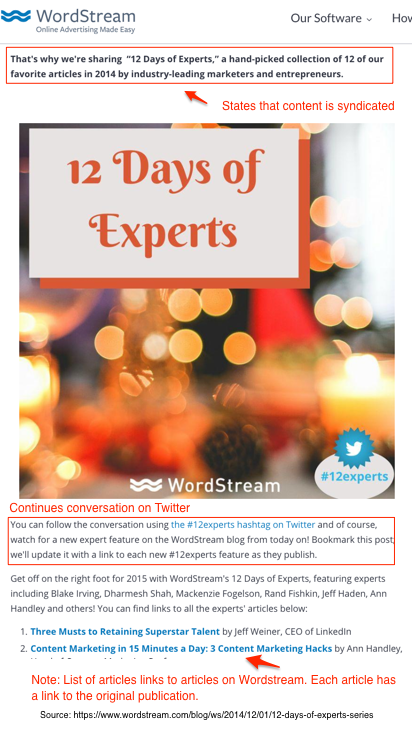 For example Wordstream republished existing content from relevant influencers in a series they called, “12 Days of Experts”. Wordstream collected the articles into an offering with an overview. 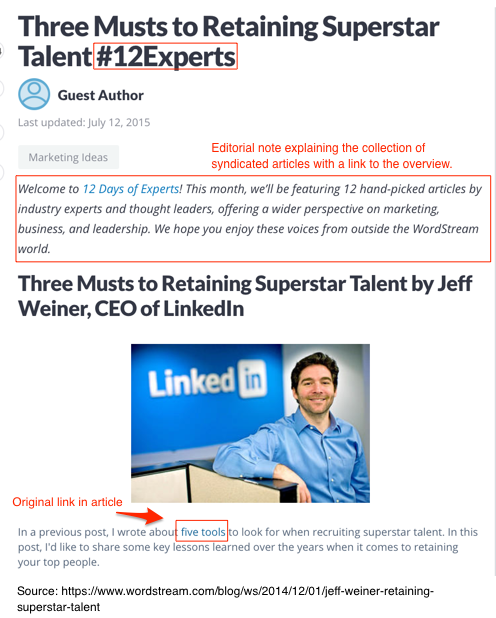 Here’s a sample of the first article by LinkedIn’s Jeff Weiner. It keeps the original title, image and links. Use your content distribution checklist. In addition to improving the reach of the syndicated piece, it supports your syndication efforts. Determine which platforms and types of content perform best. Also decide where to invest in content placement and how it performs against your goals. Measure lead cost, lead volume and lead quality as well as traffic to your website and brand lift. 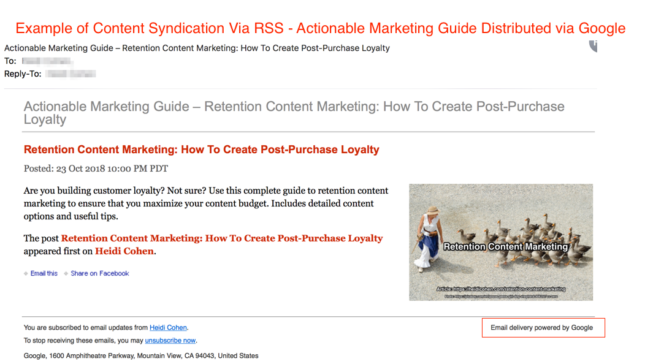 Here are the 7 major types of content syndication. 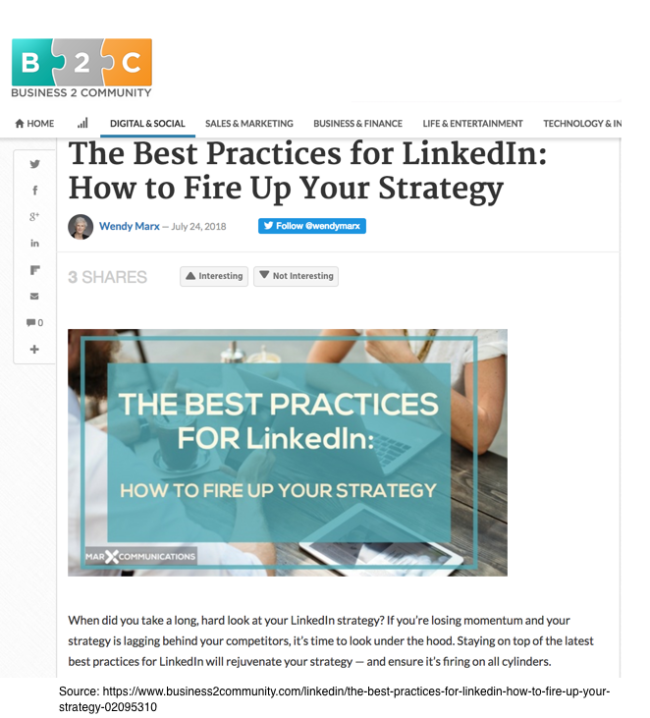 Use Medium and LinkedIn Pulse to expand your long form content’s reach. Attract reader engagement, often as long as 7 to 11 minutes. Require little work or investment. Although changing the headline and header image are recommended. Options include sites like Social Media Today, Business2Community, and Small Business Trends. Getting selected by high profile media entities often involves a strong guest blog posting approach such as Larry Kim and Leo Widrich. While RSS stands for Really Simple Syndication, it’s the most common format for publishing feeds. Feeds are created by a small piece of code that’s already in your publishing platform (like WordPress). As a result, your blog automatically provides notices of your most recent posts with either teaser content or the full text. If you want people to read your content, then give them the full text. If you want to increase web traffic, only send teaser content. Beyond your text content, use feeds to distribute audio and video content published on your blog to extend their distribution. BTW, here’s how to use Google’s Feedburner. Even better, it’s free! 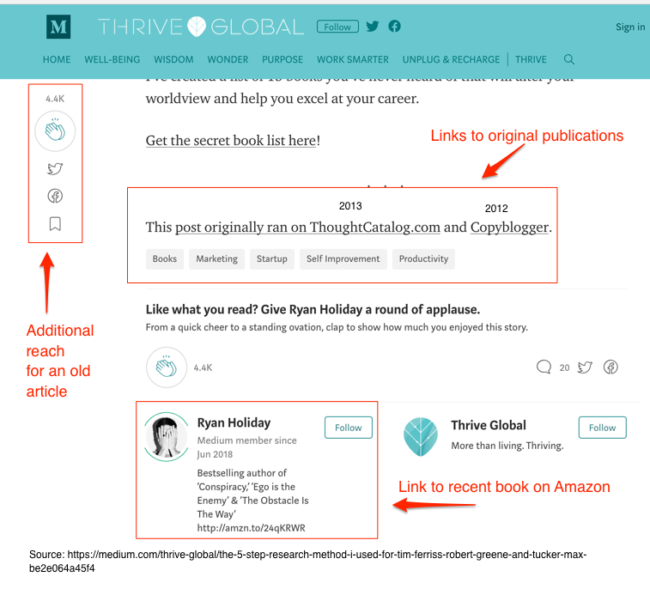 Maximize reach by placing a linked icon on your blog for accessing your feed. Get your feed listed on relevant feed readers as well as content discovery sites such as Flipboard. Use a variety of tools and networks to republish other content formats. Expand audio distribution with iTunes and SoundCloud. Extend video content distribution with YouTube and Ooyala. Increase infographic distribution with Visual.ly, Pinterest and personal outreach. Spread webinar distribution via a service like BrightTALK. After crafting guest posts for other sites, get additional benefit from your work by republishing them on your owned media. Before hitting publish, follow these 4 steps for each guest blog post. Get permission from the original publisher. Follow their guidelines. Wait at least one month before republishing it. Give the original source time to maximize attention for the post. 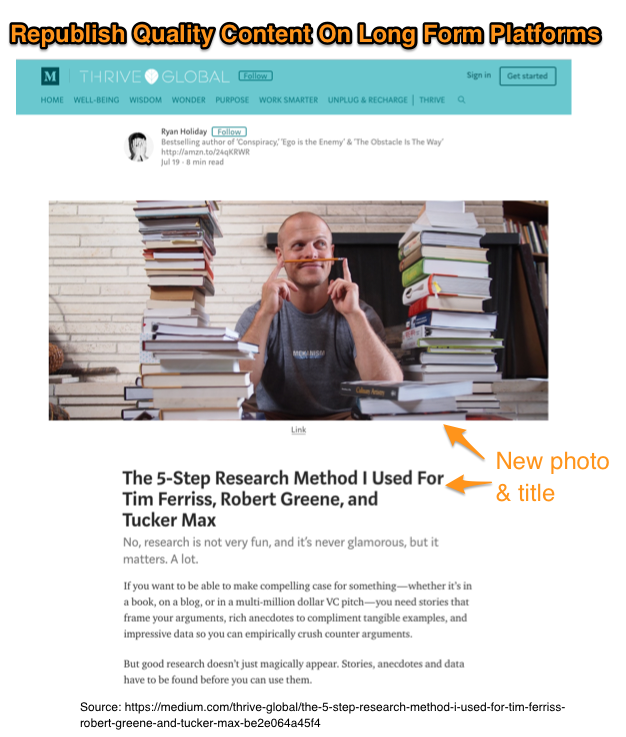 Change the title and header image to attract attention to give the post a fresh look and make it stand out. Add a note stating where and when the article was originally published with a link to the original post. This avoids creating duplicate content! With paid syndication you spend money to place your content on third party platforms and syndication networks. By contrast, native content advertising consists of content creation and placement. As a result, the content looks like editorial. Since you’re paying for placement, spend the time to segment leads and measure results over time. Among the key metrics to track in addition to cost per lead are the total acquisition costs and lifetime value. Press release-like distribution. Owned by PRNewswire, ARC acts like a PR service for articles. Content syndication networks place your content on a variety of sites. They charge on a cost-per-lead (or CPL) basis and cost about $20 to $80 per lead according to Uberflip which has relationships with different content syndication networks. Work with blogs or websites that target a similar audience to yours to cross-publish your content. This means that you publish their content and they publish yours. You can do this on a regular or one-off basis. You expand your reach but there’s no monetary exchange so this approach appeals to small businesses with limited budgets. To ensure success, specify the details of the exchange including type, length and quality of content, publication timing and related promotion. Use content syndication to diversify your content distribution channels. Further, by syndicating existing content, you get increased value from it with little or no cost. 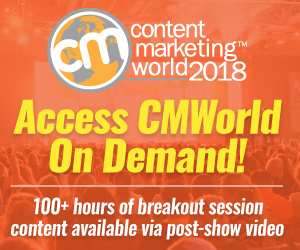 As a result, content syndication yields high content marketing ROI since most, if not all, of the content creation costs were already accounted for. Don’t syndicate all of your content. Keep a portion of your content unique to your site. This gives readers a reason to visit your site. I recommend syndicating about 50% of your content at most. Make your syndicated content contextually relevant based on where it’s published. Tweak or change the headline to attract the most readers. Also add a new image or photograph. Include a call-to-action (or CTA) with a related link. Entice readers to click through to your website for more content but don’t link to product and sales pages. 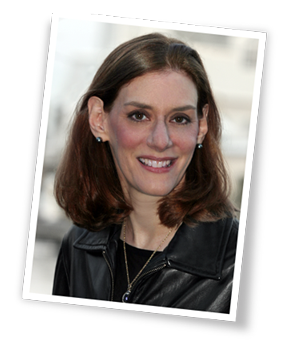 Get an on-going column on a third party site that syndicates its content elsewhere. For example, Inc. syndicates its content to Business Insider. While this requires new content creation, it expands your reach to other publishing venues without additional work or cost. Add regular guest blogging to you editorial calendar. Although guest posting requires time and/or money to create fresh content, it gets your name in front of new audiences and supports search with at least one backlink. Further, it can lead to syndication opportunities. Add content syndication to your content distribution plan to extend your content’s reach and visibility over time. Not to be confused with curated or repurposed content, content syndication is the republication of existing content without addition creation. Syndicating your content is a no-brainer because your only direct cost is paid media placement. To reduce concerns about being the initial source for search standings, allow at least a month before republishing content elsewhere. Then start small and test adding syndication to your distribution mix. Tags content distribution, Content Syndication, guest blog posts, LinkkedIn Publishing, Medium, Slideshare. Bookmark the permalink.